Last Saturday, 20 December, I went back to my old school, Loretto, for the first time in 29 years. I was drawn not by any great feeling of nostalgia for my schooldays, but because the story of my great-grandfather, Archibald Henry Buchanan-Dunlop, was the impetus behind events that were being held there to mark the centenary of the Christmas truce on the Western Front. 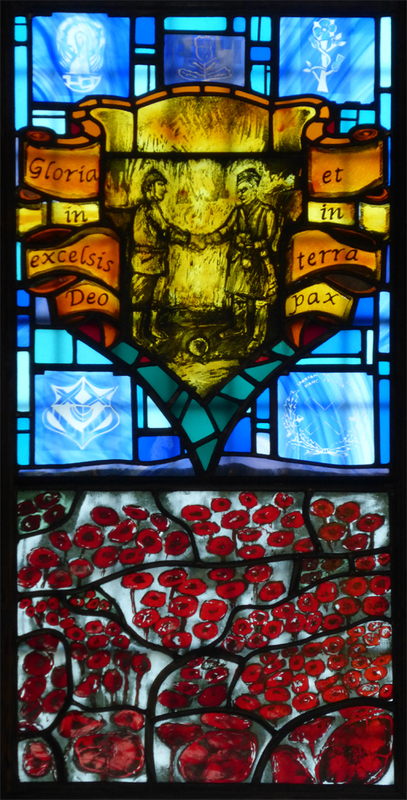 These culminated in the unveiling, in the school chapel, of a window made by Kate Henderson commemorating the truce and my great-grandfather’s role in it. But what, exactly, was his role? 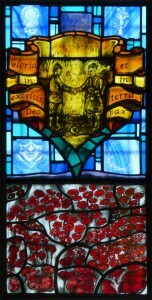 But when I read a standard account, Brown and Seaton’s 1984 Christmas Truce, which included Buchanan-Dunlop’s letters amongst its many sources, the picture appeared rather different: he had certainly sung carols (from the programme of that year’s Loretto end-of-term carol concert), and met and swapped tobacco and papers with the Germans – but nothing gave me the impression that he had been instrumental in bringing the truce about.2 Indeed, Brown and Seaton show that the Truce was largely a spontaneous affair, extending over at least twenty miles of front line and involving numerous regiments on both sides: hardly something that could have been instigated by a single company commander. So, being a conscientious historian, I thought I would go back to the primary sources: Buchanan-Dunlop’s letters home, and the contemporary press reports of his participation in the truce. This essay aims to show what happened to him over the Christmas of 1914 (not just during the truce) in his own words, and looks at how his apparently unexceptional participation was seized upon in the press, and then by his superior officers. 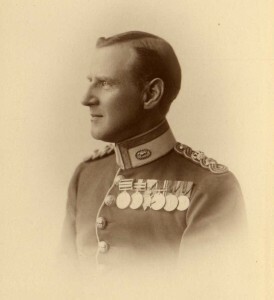 Born on 26 September 1874, Archibald Henry Buchanan-Dunlop (known as Archibald), was educated at Loretto School, outside Edinburgh, from the age of 12, leaving in the summer before his 15th birthday in 1889.3 He went on to Sandhurst, and was commissioned into the Royal Berkshire Regiment in 1894. He married Mary Agnes Kennedy on 3 March 1900, a few days before sailing for South Africa and the Boer War, during which he served as a Railway Staff Officer. He joined 2nd Battalion The Leicestershire Regiment as a captain in 1903, and in 1905 was seconded to the militia, serving as the adjutant of 3rd Battalion The Lancashire Fusiliers. 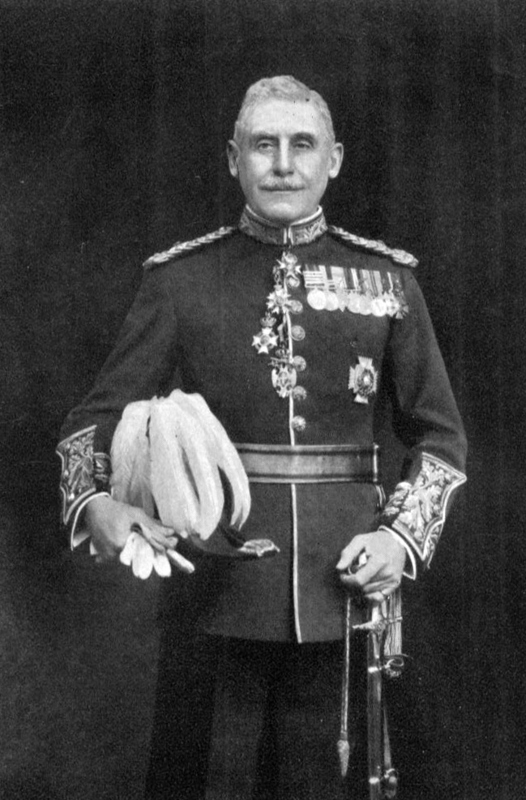 He also served as Director of Army Gymnasia. Buchanan-Dunlop retired from the regular army in 1909, aged 34 or 35, and returned to Loretto to teach gymnastics and drawing, and to command the school’s Officer Training Corps (OTC). On the outbreak of the First World War, he was mobilised and appointed to Headquarters for embarkation duties.4 He sailed to France on 1 November,5 and joined the 1st Battalion of his old unit, the Leicestershire Regiment.6 By now, he was 40 years old, and had three sons: Robert Arthur, born in 1904; Archibald Ian (my grandfather), born in 1908; and David Kennedy, born in 1911. He already had fifteen years of service as a regular officer under his belt. Last night, marching up here (you have to come up at night or you get picked off) I had a narrow shave, the enemy, who are only a couple of yards from our trenches, fired, presumably at the sound of our marching, & just missed my head. The bullet went into the bank behind me. Secondly we have been reviewed this afternoon by The King!! Wasn’t it good of him to come out & buck us up. I’m so glad we happen to be one of the Regiments out of the trenches when he came. He was so nice & took notice of each officer. The Prince of Wales was with him. The King is looking older & more careworn, no wonder, poor man. Isn’t it sporting of him to come out? We marched of course to a town some miles behind our billets,15 for of course we had to be well out of range of every gun the Germans have. Aeroplanes were out & about all the time keeping a good look out. I got on to my horse for the first time – you know all company commanders are mounted now – also I am at present second-in-command – He is such a big beast, I can hardly reach the stirrups. A chesnut [sic] with hogged mane & long tail. Robert16 will tell you all about him for I’ve written to him, & described my steed. What wouldn’t I give just to spend Christmas day with you & our little boys.… I shall miss the Carols in Chapel this year & the Christmas anthems. You don’t really know how fond you are of them till you’ve got to do without them. I must begin a letter to you tonight. I’ve had quite a cheery Boxing Day: Hard frost & bright snow. I had some cake & a glass of Madeira & a chat, with the Colonel this morning; & Buggins23 asked me to lunch with him, as he had had a turkey! sent him & mince pies. He lives a good way behind us, as he is in Reserve with his Company.24 I had a tremendous lunch & was half comatose in a chair by his fire (unheard of luxuries when Colin suddenly came in. )25 I was glad to see him. It appears that he is about 5 miles or more to our right, & having a day off – for the Wurtembergers in front of him had agreed to an informal suspension of hostilities – had set out to find me, not knowing my Brigade. How he managed it I can’t think, but he found my dug-out and was re-directed to A company. He was so cheery, & looking very fit & well & awfully clean & neat. How he managed it that, too, I can’t think. He was much struck by my appearance I think, & no wonder, for I was in a waterproof, mostly clay, & had my Balacklava helmet on with a bit of Jean’s26 holly in it, & my moustache & beard are not tidy, & I’m not clean. He stayed about half an hour with us. I’m so glad we have found each other at last. Then this morning I got my Christmas Box from Princess Mary – a card, a pipe, & an embossed box in plain metal with tobacco and cigarettes in it – lastly & most important I got two letters & a letter-card from you, dated Nov. 10 – Dec 21 – Dec 23. The first had been to the Royal Warwicks why I don’t know. So you see my darling I’ve had quite a jolly day. – The enemy on our left – Saxons – are still out hobnobbing with our fellows, but the folk opposite us – Prussians – are very vicious indeed.27 It has begun to snow now – horror! I shall send you my Christmas cards from the King & Queen & Princess Mary – you might get little frames for them my sweetheart. One of my NCO’s is off on leave today, so I’m sending you 2 snapshots by him, taken by Eric Long, our doctor,30 in the trenches on Christmas Day. We mayn’t send photos home in letters, so I seize this opportunity. Wilson is the English International Rugby Player, he looks like a girl in the photo, but he doesn’t really.31 My beard was just beginning to grow, so I look a dirty beast. You see the way I wear Katie’s32 cap. … My dugout is just behind me, in the photo. 24 [Dec.] Snow. Quiet all day. 25 [Dec.] Frost. 2 men killed one wounded. I’m writing to you with Robert’s pencil – a present which I wanted very much, & am delighted to have. Please thank him very much. I’ve got him a badge out of a Saxon soldier’s cap. I’ll try and get it home to him. I got your dear letter today sending one from Robert, please thank him very much & give him the enclosed – a badge from the cap of a soldier of the 107th Saxon Regt —. The Saxons still refuse to fight the Regiment opposite to them,39 it is a funny game. They say “We are Saxons, you are Anglo-Saxons, why should we fight”? I and my Company paraded at 8.15 pm & returned at 3. am, having been marching and digging all the time. The enemy, 50 yards away, turned their searchlight on us, but never fired a single shot, altho’ we were working in the open. They were the Saxons, who have been at peace since Christmas. There seems to be a feeling prevalent that the war won’t last very much longer. I don’t know, myself. I have to go into the trenches again on Saturday (today’s Thursday) & only stay in for a week at a time. We shall be opposite the peace-loving Saxons. Last night they shelled (not the Saxons) the trenches we were in last, but apparently without much effect. We are not, when in our new trenches, to mention the Saxons in our letters home, so you will hear nothing about them in future. Although, in our trenches we are too near the enemy for either lot of fire-trenches to be shelled; yet our artillery yesterday shelled a factory a little way in rear of the German lines. Our vis à vis told us (shouted across) more in sorrow than in anger that they had had 16 killed & wounded by it; the exact number that a Regt just behind us lost the day before, from German fire. The Kaiser’s birthday today & our vis à vis have flags flying. The Germans are firing hard over our heads with heavy guns at one of the Armentières Churches, the one I’ve sent you a photo of. It’s about all they can do to celebrate the occasion, as they tried to find our guns which “saluted the happy morn”, but couldn’t. So, from Buchanan-Dunlop’s letters we know that he and a group of officers and men had sung carols, presumably from within their trenches, to the Germans on Christmas Eve; the Germans had replied in kind. On Christmas Day, the two sides met for an hour in no man’s land and exchanged tobacco and newspapers; this seems, if it was instigated by anyone, to have been started by the Germans, who drew the line down the middle of no man’s land. The truce had continued over Boxing Day on Buchanan-Dunlop’s left, but not directly opposite him. 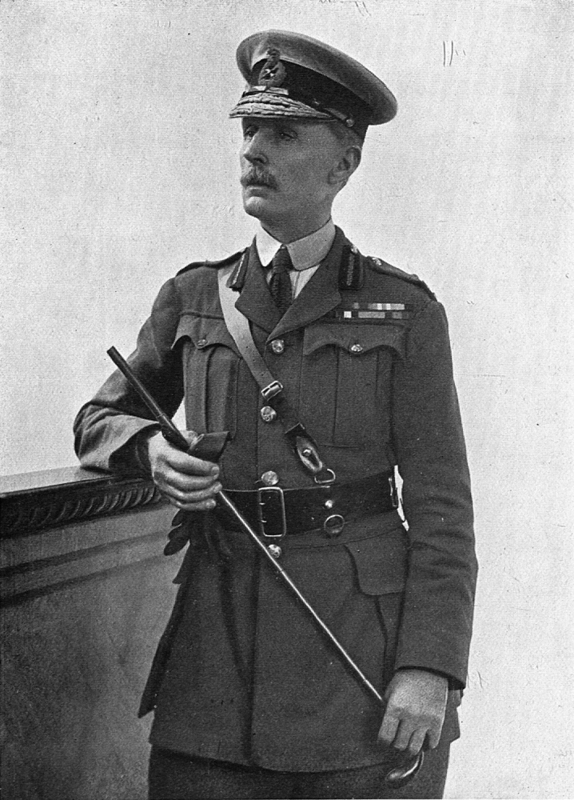 The General had been angry at the informal truce, but appeared to have been mollified by the service for his company held by Buchanan-Dunlop. Despite Buchanan-Dunlop’s worries about the aggressive Prussians in front of him, the truce continued into 27 December, with both sides sharing tea in no man’s land, and a group of German officers and men unilaterally coming over en masse into the Leicesters’ trenches and refusing to leave. 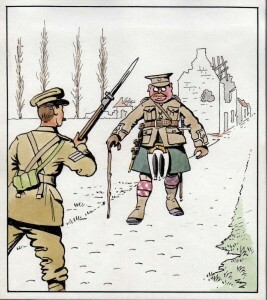 Meetings between the troops seem to have been over by 28 December; an unofficial ceasefire persisted until at least 11 January 1915, even longer (13 January or later) on the part of the Saxon infantry, but not the German artillery; serious hostilities with all German units had resumed by 3 February. Brown and Seaton describe the extent to which the truce seized the imagination of the British press, with letters and articles on the subject appearing in many papers from the end of December onwards.43 A few of them drew upon letters written by Buchanan-Dunlop, and mentioned him by name. Major A. H. Buchanan-Dunlop, second in command of the 1st Battalion, Leicestershire Regiment, an old Loretto boy, who is a member of Loretto School staff, and was called up for war service as one of the Reserve of Officers, has written a letter from the trenches, dated Christmas Day, in which he describes how, by mutual agreement, there was a cessation of firing; how British and Germans met half-way between the opposing trenches to exchange cigarettes and chocolates; and how, from the programme of the Loretto School concert given at the close of the term, December 17th, which had been sent out to him, he and some brother officers and soldiers sang the Christmas carols printed thereon, also some Christmas hymns, to which the Germans replied with some of their sacred songs. 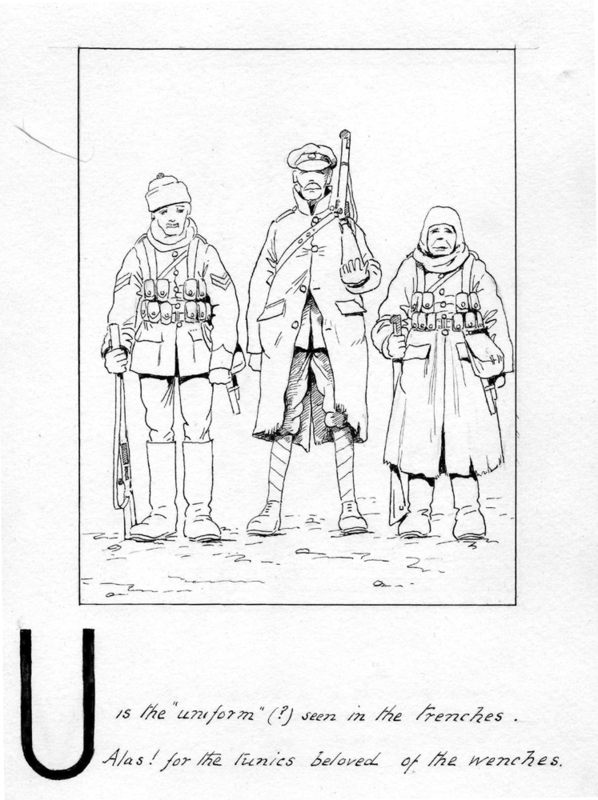 The significance of this page of the Daily Sketch is already known to those who heard Colonel Buchanan Dunlop Toc H. tell the story of the Christmas Truce to a gathering at Mark I on Dec. 22nd. 1920. The faked picture on the right was the means of inflicting a great injustice on a gallant & much loved man. A. H. B.-D. was one of the first supporters of the House in Pop., being at that time commanding the 1st Leicesters in VI. Division. P.B.C. is presumably the Reverend Phillip Byard Clayton, known as Tubby, who founded Talbot House, a rest house for soldiers of all ranks in Poperinge (‘Pop.’) in 1915, which became known as Toc H, using the phonetic alphabet of the time. Mark I is the second of Toc H’s hostels in London, in Queensgate Gardens, Knightsbridge, established in 1919. As Clayton notes, Buchanan-Dunlop was an early supporter of Toc H, which went on to become a significant charity and voluntary movement focussing on fellowship and service. This aggressive response suggests that the Sketch article was not as neutral as it at first appears. In fact, it subtly played up Buchanan-Dunlop’s role in ‘organising’ a truce, calling him the ‘leading “chorister”’ and a ‘moving spirit’, as well as claiming that the Germans had accompanied the Leicesters’ carol-singing, rather than replying to it. And the inclusion of a large portrait of him on its front page would only have increased the impression that he was in some way responsible for the truce. Last night I got letters from any number of folk as I think I told you in yesterday’s letter & four copies of the Daily Sketch, underlined and blue-pencilled. Sir H. Smith Dorrien52 is awfully angry about it. Luckily Price’s letter came after I had had to give my official explanation, in which I truthfully said I hadn’t any idea of how it got there – for young Brown53 told me that Father knew nothing of the photo, as he had discussed it with him. G.N.P. referred to my letter in his sermon in Canon Reid’s church, & an account of his sermon was in the Scotsman, as also extracts from my letter to George Davidson – Little McGill, the fat reporter, is of course the real culprit, he went & got my letter from Davidson, & borrowed from G.N.P. the photo you gave him of me. G.N.P. is now rather frightened at what has happened & hopes I’m not “awfully sick about it”. I shan’t tell him what a horrid nuisance it has been. The Brigadier General54 came hurrying to our Headquarters to investigate directly he heard about it. However as I say I’ve no military career to blast, for I certainly shouldn’t dream of staying in the service if Sconnie55 wants me back, & I can get to Loretto again – Also I don’t mind generals, and am not at all afraid of them. … [later, at 8 o’clock] Your letter of the 5th just came, also letters from Uncle P. muncle, [?] & G.N.P. The General is pleased with our work last night. He is still worrying over that wretched Daily Sketch, & the whole correspondence came back last night for further explanations from me. Bother the whole thing! I have carefully kept a copy of the General’s orders sent round on Christmas Eve – there’s only one I did not obey, and I at once at the time wrote to the Colonel giving him my reasons for not complying with it, which were most significant military ones, and he wrote back “I approve”. Further even if the General still insists that I disobeyed orders, I can point to the fact that on Christmas Day, when he visited my trenches, I had a long talk with him & told him of everything I had done – He ought then & there, if he considered I had done anything wrong, to have written at once to the Colonel, & said so. It’s not as if he had heard of it just now for the first time. — No it’s just that he’s annoyed at seeing his beloved Brigade practically ridiculed in the cheap press, and he’s determined to “take it out” of somebody. 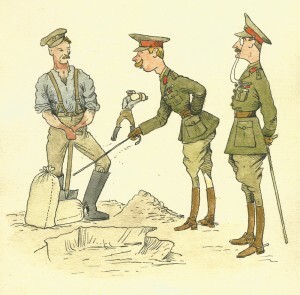 I’m quite determined though, that I won’t take it “lying down” The Colonel is absolutely with me, & has authorized me to tell the General that he is perfectly satisfied with my conduct throughout; & he agrees with me that if the Brigadier doesn’t give me satisfaction, I should refer the case to the Divisional General. Possibly I shall be shipped off home as a nuisance, but I mean to fight it out – Its [sic] a true instance of “Save me from my friends”. I know all this will interest you my darling, so I write at length on the subject. You needn’t be in the least bit worried, I’m quite capable of keeping “my end up”; & I have no military career to “blast” so I’m in a very strong position. Thanks my darling for the extract from my letter. It will be most useful if the General asks me exactly what I said. I have heard nothing further from him yet. … My girlie, you’re not to worry any more about the “Daily Sketch” & the other papers. It was G.N.P. of course who gave the photo. I did a lot of work in the trenches60 with my company & earned the General’s outspoken [?] approval. Col. C61 says I’ve secred [sic; secured] a very big good mark, all I can say is that, with this General (Ingouville-Williams) I shall want it, after the Daily Sketch episode. However, after all, the approbation of the military authorities, altho’ nice to have, is not essential to me now as it was when I was a subaltern. 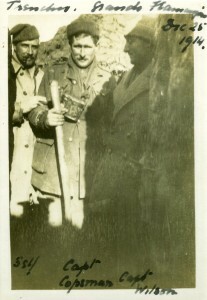 I thought matters over for a couple of days, & concluded that he had probably done the same – so when I met him alone one morning in the trenches, I began to talk to him about it – he said the incident was closed, & he didn’t want to hear anything more about it; but I stuck to my guns & said, I regretted extremely that I had given him occasion to think that I had disobeyed his orders, but that I had been genuinely astonished when I heard he considered I had done so; but that I saw his point of view as well as my own. He said that I had now to “redeem my character”. 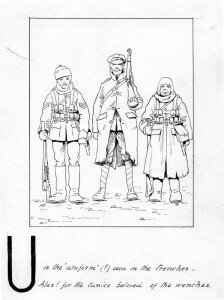 I suspect that that staff officer from the Indian Cavalry may have inspired one of the drawings in Buchanan-Dunlop’s Alphabet from the Trenches. Not much news for you today, my darling, I’ve been hard at work all day & got through some satisfactory jobs.65 The General was pleased when he came round this afternoon. Violet66 does seem to think G.N.P. has erred deeply. I don’t mind a bit darling, & he must never know the little worry I had over the business. Capt. Holmes67 wrote to me today enclosing THE picture from the Daily Sketch. It fails to “dread” me now – not that he meant it for anything but most friendly – shall we say – approbation, not the Press notice, but the carolling. I shall never escape from it. I’ve heard nothing further about my application. I haven’t worried about asking at Brigade Headquarters as I’m not yet in good odour. Sweetheart I’m actually 2nd in command now & living at Regimental Headquarters. I’ve handed over my company to Capt Wilson. … Colonel Croker is very seedy I’m sorry to say. Last night he was too ill to do anything & the General put me in command of the Regiment. 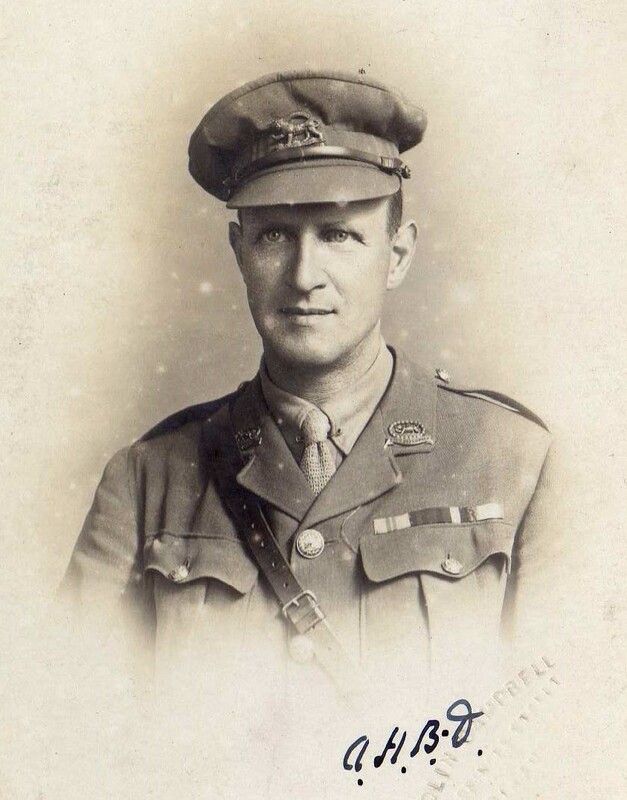 And he was sufficiently well-regarded by the Staff to be given the command of his Battalion on 25 October 1915, after Lieutenant-Colonel Stoney Smith, then in command, was killed by a sniper. 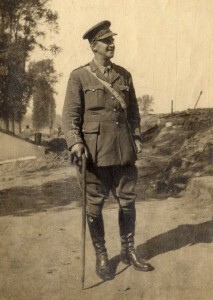 He was promoted temporarily to Lieutenant-Colonel,69 and held the post until 6 February 1916. That year, he was evacuated to England as a casualty, and invalided out of the army the following year due to the effects of gas. 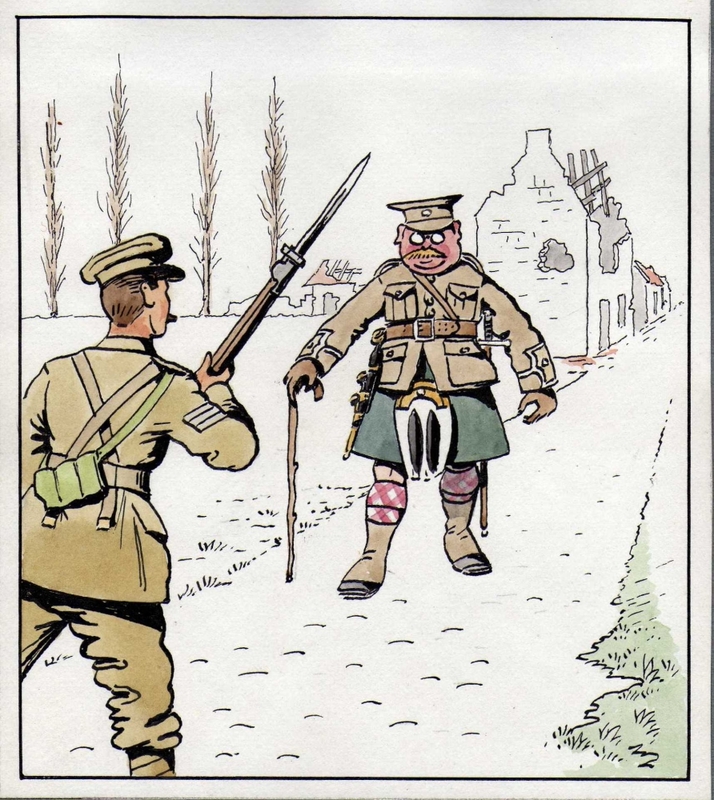 He returned to Loretto, and joined the Volunteer Corps, commanding 3rd Battalion The Royal Scots (apparently also known as the Midlothian Volunteer Battalion) until 1918. His service record and his decorations show that Buchanan-Dunlop was a conscientious and long-serving soldier with a strong sense of duty – and perhaps a slightly sceptical attitude to his superior officers, which he would have shared with soldiers throughout the ages. Just got your dear letter written on the 11th. Well, if Loretto benefits in any way from the “Daily Sketch” affair I shall be quite satisfied with everything. People are so funny in their ways of looking at things though. According to Clayton’s inscription beneath Loretto’s framed copy of the Daily Sketch’s front page, Buchanan-Dunlop continued to believe that reports that portrayed him as some kind of ‘moving spirit’ were incorrect, and did him a serious disservice. 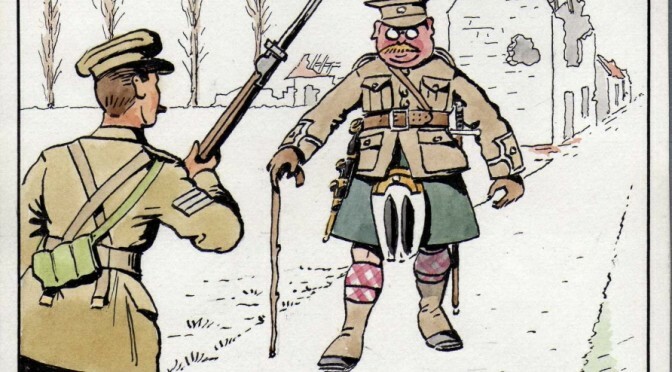 Taking his view (and after all, he was there, between the lines, 100 years ago), we should therefore be wary of accounts which state that he led the truce in any way. And if we downplay his role, as he would have wished, we do not in any way downplay the significance of the events in which he was involved. The Christmas truce remains a remarkable occurrence, even after some of the surrounding mythology has been stripped away. I have been helped greatly in preparing this piece by Graham and Robin Buchanan-Dunlop, who provided copies of their grandfather’s letters, photographs, and much information; by Kate Henderson, who kindly gave me permission to publish the reproduction of her work; and, at Loretto, by Gavin McDowall, June C. Dunford, and Jill Smith, who helped provide copies of the Daily Mail and Daily Sketch articles: thank you all. 30 December 2014: typos corrected; order of battle adjusted to place Saxons opposite North Staffords on Leicesters’ left, and Westphalians opposite and to right of Leicesters (nn. 16 & 25 adjusted accordingly); Leicesters’ involvement in ceasefires after 27 December clarified; Weintraub reference added to n. 40; ‘young Brown’ identified in new n. 50 [20 February 2015: now n. 53]. 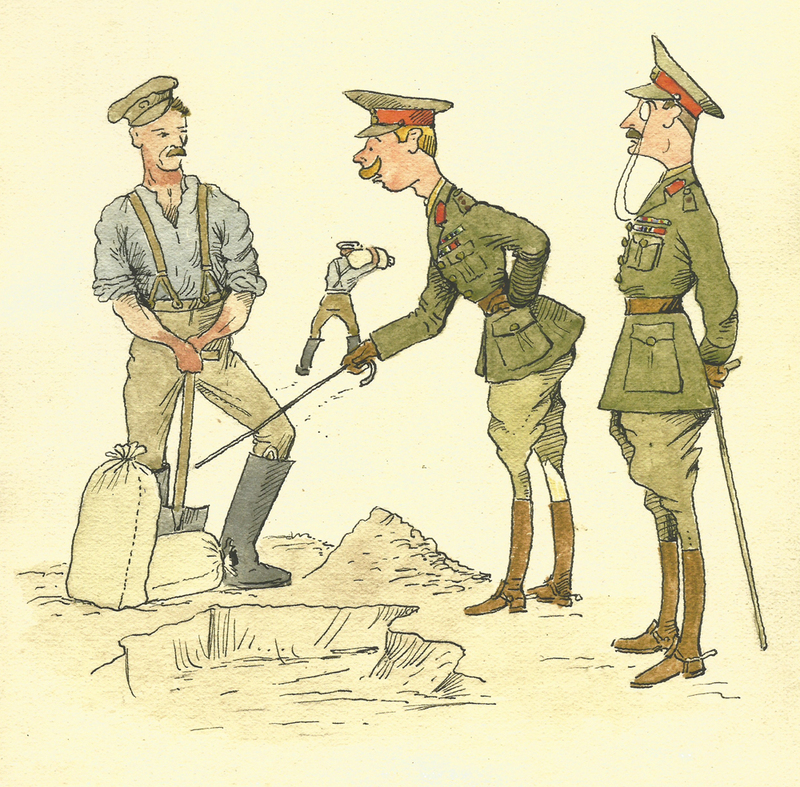 20 February 2015: typos corrected; references to Wylly’s History of … The Leicestershire Regiment in the Great War added, and additional biographical information/clarification given for Capt Tidswell (in new n. 9), Lt-Col. Croker, Capt. Tollemache, Lt Long/Lang, Capt. 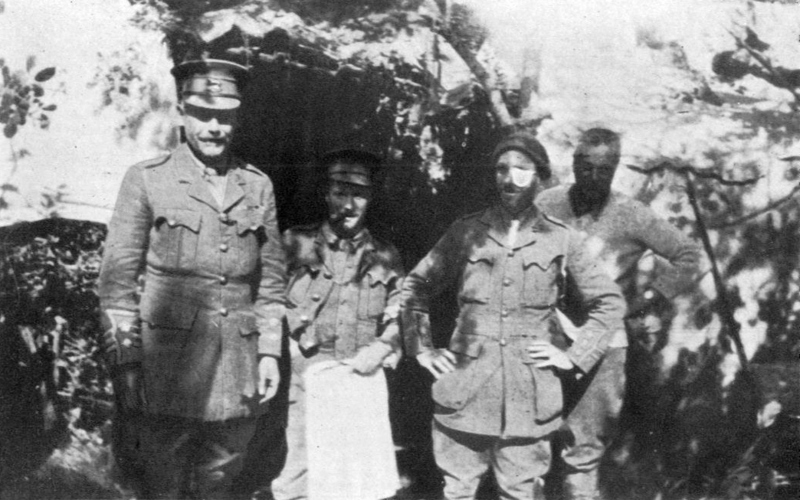 Wilson, Lt Herbison, Maj. Stoney Smith, and Lt Brown; Sgt Hayball’s account of the Christmas truce added; images of Battalion HQ, September 1914, and Maj.-Gen. Croker added; occasion of Buchanan-Dunlop’s promotion to CO expanded; notes renumbered accordingly. Ed, thanks for your kind words – and apologies for the delay in replying: I wanted to check some papers first, and I only have access to them at weekends. I’m afraid I can’t say one way or the other about Drumhead: the only sources I have are photocopies of the letters, without their envelopes, and the letters themselves don’t carry a recipient’s address. I can’t recall anything in them that would say where they were sent to – though I assumed when writing the piece that for much of the time the family were in Musselburgh, where A. H. B.-D. was teaching at Loretto before the war. I’m not sure at what point the family moved out of Drumhead. I can have a word with relatives who are better informed than I am, if you like. I’m curious: what has led you to researching Drumhead? Thanks so much for responding! My family and I moved in to Drumhead three years ago. We are slowly restoring the house and grounds, hence my interest in its past. There is very little left in the interiors and no records that I can find. AB left his initials in the house walls and internet searches led me to your account. I’d be most grateful to discover when your family moved out. So interested to read this, thank you.